Blu-ray will be heading to the Okefenokee Swamp in February. In another recent press release, Twilight Time has slated the 1941 film 'Swamp Water' for Blu-ray on February 14. Pantheon director Jean Renoir’s first American film, an adaptation by Dudley Nichols ('Stagecoach,' 'The Informer') of Vereen Bell’s best-selling novel set against the mysterious backdrop of Georgia’s Okefenokee Swamp, weaves the tale of a young man (Dana Andrews) who ventures into the swamp’s taboo territory. There he forms a tenuous partnership with a half-wild fugitive (Walter Brennan), the victim of a miscarriage of justice. Also starring Walter Huston and Anne Baxter, and featuring a brooding score by David Buttolph, available on this Twilight Time release as an isolated track. The Blu-ray is limited to 3000 copies and will feature 1080p video, a DTS-HD Master Audio Mono soundtrack, and supplements include Isolated score track and liner notes by Julie Kirgo. 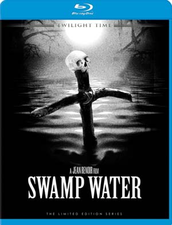 'Swamp Water' is available here from Screen Archives Entertainment for $29.95. You can find the latest specs for 'Swamp Water' linked from our Blu-ray Release Schedule, where it's indexed under February 14.